David Nyfjäll putts. For the second week in a row, the freshman led NU — this time at the Boilermaker Invitational. Northwestern closed its regular season with a fourth-place finish at the Boilermaker Invitational this weekend. 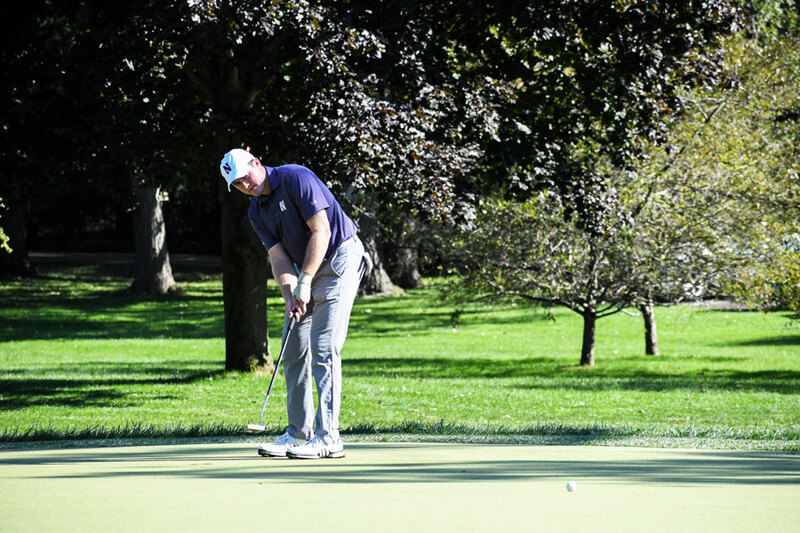 At the Indiana-based tournament, the Wildcats finished two 18-hole rounds at 6-under-par. Sunday’s final round on the Kampen Course was cancelled due to weather. Earlier this month, coach David Inglis said he was hoping freshman David Nyfjäll and senior Ryan Lumsden would bounce back and put up performances like their strong showings of the fall. And for the second week in a row, Nyfjäll led NU — this time at the Purdue course, finishing in a tie for third at 6-under. It’s his third top-five finish this season. After the tournament’s first round, Nyfjäll was the lone Cats golfer under par. Sophomore Eric McIntosh also broke the top-15, ending the second and final round tied for 12th place. Inglis said while he was happy with both individual performances, similar to other competitions this spring, the team has struggled to produce strong top-to-bottom showings. NU was second in the field in Par 3 scoring, ending the shortened tournament at 1-under on those holes. Nyfjäll finished at 2-under — tied for first individually — on Par 3s, while junior Everton Hawkins went 1-under on the Par 3s. Purdue’s Par 3s often have one side with a water hazard, and Inglis said the team often runs drills that simulate that specific challenge. But he noted that success didn’t carry over to Par 5s — the Cats finished at two-under with several teams scoring better on those holes. Along with Nyfjäll and McIntosh, Lumsden also shot under the tournament average of 146.08. After shooting 2-over on the back of three bogeys in round one, Lumsden landed five birdies over the next 18 holes to post a 1-under score in round two. Lumsden’s five were among the team’s 30-plus birdies over 36 holes — good for fourth-best as a team after two rounds. Though Lumsden hasn’t consistently put together the team-best showings he did in the fall, Inglis said his scores haven’t reflected how well he’s played. “And that’s actually an encouraging thing,” Inglis said. The trip across state lines to Purdue marked the end of the team’s regular season. Now, it’s full steam ahead to the Big Ten Championships in two weeks. NU finished second among Big Ten teams this weekend, nine strokes behind second-place Purdue and four ahead of fifth-place Michigan. At the conference championships last year, the Cats disappointedly finished in fifth place, after leaving as the runner-up in 2017. But, this year, “more than ever, it’s a wide-open race,” Inglis said. With ten days away from competition, Inglis said he’s optimistic at what the NU can accomplish if everything falls into place.